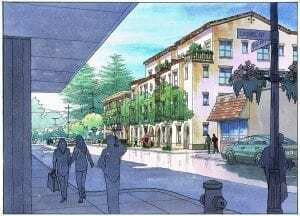 I just completed this watercolor rendering of a proposed Office building project near San Francisco, CA. 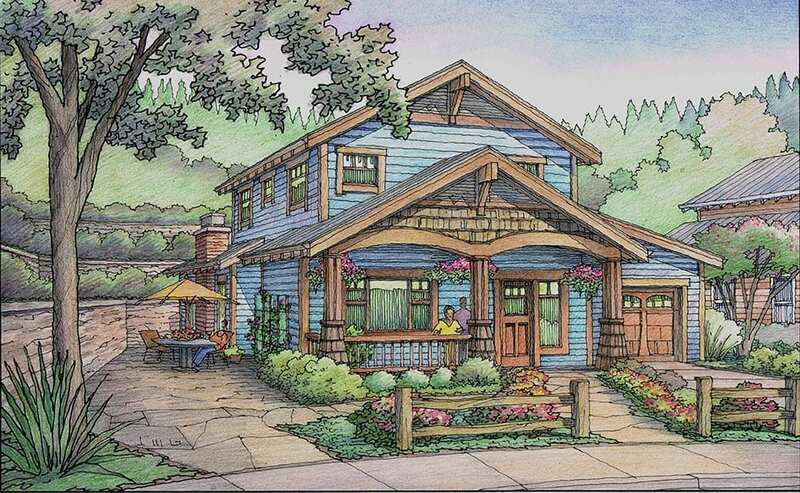 The architect is Metier Architects of San Francisco…..
Last Friday I finished this color pencil rendering of one of the cottages planned for a retirement community in Auburn, California. The project is Rincon Del Rio, and it will be a large development for senior residents in the Sierra foothills. Having done many renderings for this project over the years, I have a pretty clear understanding of the developer’s intentions for this age-in-place community. 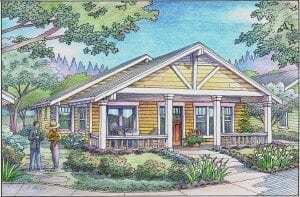 This particular housing unit–one of three different models in the Cottage category. These will be individual homes of about 2,300 square feet with most of the essential living quarters located on the main floor, although there is an upper level with interior stairs. Tricky part of this rendering is the blue color which always poses a challenge with the sky treatment. 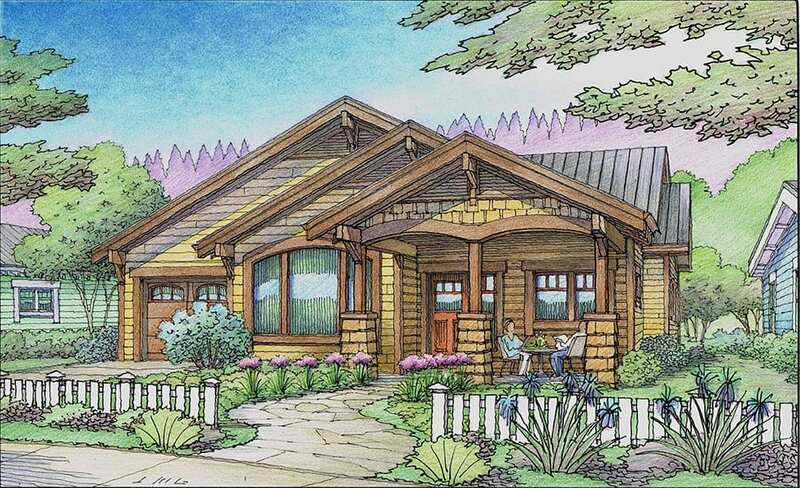 Yesterday I finished this color pencil rendering of one of the cottages planned for a retirement community in Auburn, California. The project is Rincon Del Rio, and it will be a large development for senior residents in the Sierra foothills. Having done many renderings for this project over the years, I have a pretty clear understanding of the developer’s intentions for this age-in-place community. This particular housing unit–one of three different models in the Cottage category. These will be individual homes of about 2,300 square feet with most of the essential living quarters located on the main floor, although there is an upper level with interior stairs. My main focus for this blog post is to discuss the illustration from the viewpoint of the illustrator. 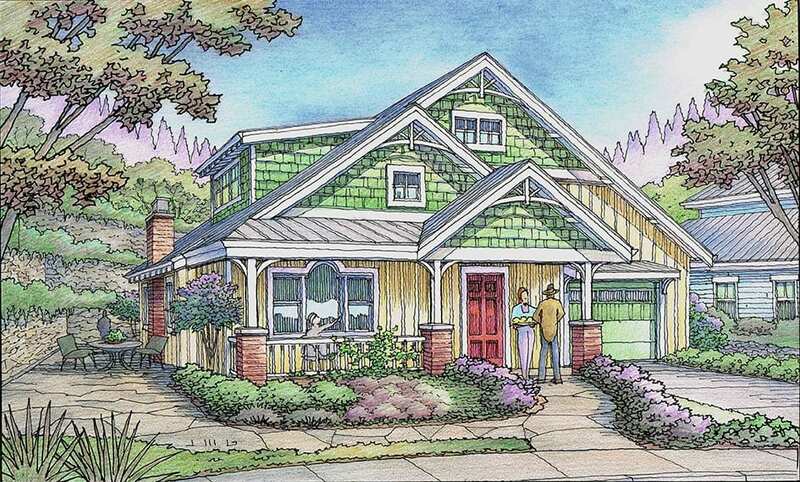 Although I was given free license to choose the color scheme for the home, I actually used the color choices suggested by the architect for this model–Michael Kent Murphy of Auburn, California. With green being one of the two colors, this presents a challenge, since green is a common landscape color. 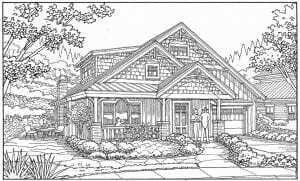 If you’re not careful as an illustrator, the main subject of the drawing–the house–can blend too easily with its background and foreground. So it helps to use only the “house green” on the house, using greenish colors of a different variety in the landscape. That was my intention on this illustration. In this way, your first look at the rendering leaves no doubt what you’re supposed to be looking at–the house. 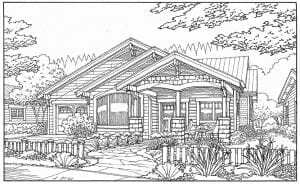 Another challenge presented by these house colors is the white trim. Similarly, it helps to keep the white elements of the rendering limited to the house, largely. In that way the impact of the white trim is enhanced–since it doesn’t compete with other white elements in the landscape which might steal its thunder. These two challenges and their solutions are not unique to this exercise and are something fairly common for many illustrations. If you keep these issues in mind as you are coloring the end result will be more effective and more successful. Over the next two days, I will be adding color to these freehand felt pen drawings…. New Color Rendering just completed late last week for the Rincon Del Rio project planned for Auburn, CA…..
Just finished the color for this rendering this week ! 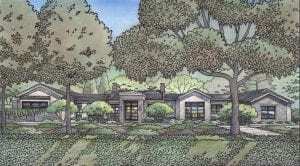 This color pencil illustration in perspective was commissioned by a longstanding client of Jeffrey’s illustration business: Carol Young of Auburn, CA. 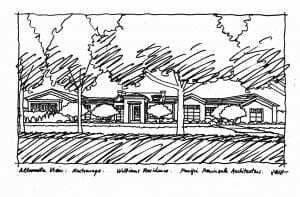 This perspective view shows one of the proposed bungalows for Rincon del Rio. 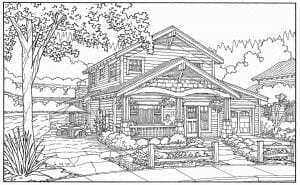 Jeffrey does many illustrations for a number of architectural clients in the South Bay, San Francisco, Bay Area Peninsula, and Sacramento areas of northern California.